SAN FRANCISCO, Calif. (July 13, 2016) — Returning to the company’s roots built upon environmental reverence and safekeeping, Royal Robbins takes a stance against sending clothing to landfills. With fast fashion taking a heavy toll on the planet, Royal Robbins’ new Royal’s Rewear Program encourages consumers to buy high quality, durable clothing made to last while recycling old product. Founders and clean climbing pioneers, Liz and Royal Robbins built the company in 1968 upon the ethos of Environmental Safekeeping, which remains a pillar of the brand today. Recently, Royal Robbins became a bluesign partner, subscribing to manufacturing practices which ensure the safekeeping of natural resources and ecological surroundings. This recycling initiative allows customers and employees to do their part and reduce the volume of waste being sent to landfills every year by sending items back or dropping them in collection bins at Royal Robbins stores. All apparel brands will be eligible for recycling through the Rewear Program. Any rewearable quality Royal Robbins apparel sent back will be re-sold at Royal Robbins retail stores in the new Royal’s Rewear department, and all other apparel received will be reused and recycled by partner, I:CO. These items will find a new home or be reused as products such as cleaning cloths, recycled into fibers for insulation and paddings or upcycled into new products. 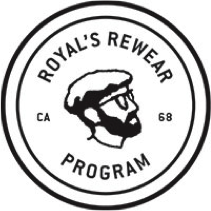 Participants in the Rewear Program will receive an incentive coupon towards a future Royal Robbins purchase. All program proceeds benefit the Yosemite Conservancy, which funds projects and programs essential to Yosemite’s future and is the birthplace of the brand. Founded in 1968 by world-renowned climbers Royal and Liz Robbins, Royal Robbins is a leading designer, manufacturer and retailer of outdoor and travel apparel. The brand has gained worldwide recognition for its high-quality active lifestyle clothing and commitment to environmental and social responsibility, innovation, style, and utility with a connection to the outdoor customer. It has built a reputation of integrating technical features for consumers seeking performance-oriented garments, but with the style and comfort to cross over into everyday life. Royal Robbins’ collection of men’s and women’s products can be found in outdoor and specialty retail partners throughout the U.S. and abroad. To view their new Spring/Summer line, please visit www.royalrobbins.com.